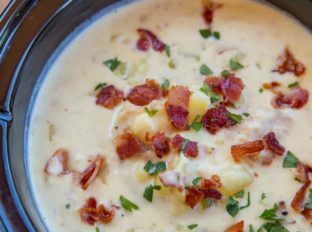 Slow Cooker Clam Chowder is so easy to make with a deliciously creamy, briny flavor mixed with smoky crispy bits of bacon and rich buttery yukon potatoes. 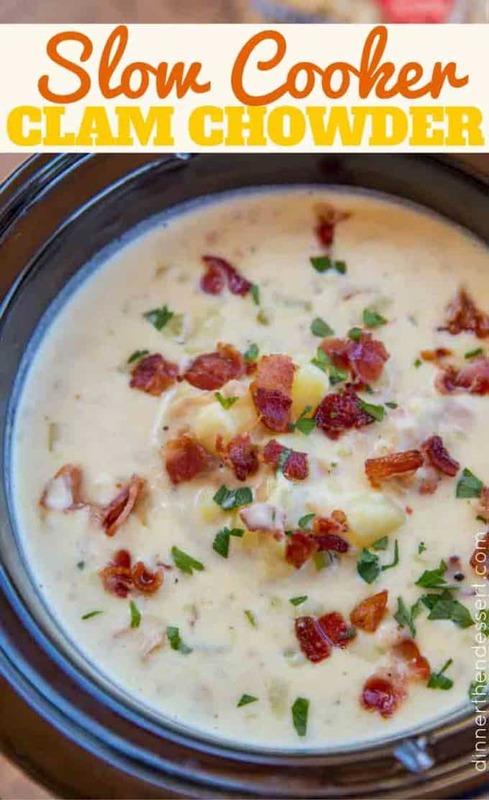 Slow Cooker Clam Chowder is an easy fall soup you’ll enjoy as well as great gameday food you can make for a crowd. We often serve this clam chowder in a bread bowl, but even more often I pile it into a giant bowl and throw a huge handful of oyster crackers on top. The flavors in the soup scream “hey its not swimsuit weather anymore!” with half and half, bacon, potatoes and clams, but just a small bowl will keep you warm and full for HOURS. We went skiing last winter a lot and one of the few meals I made in our hotel mini kitchen was this soup. 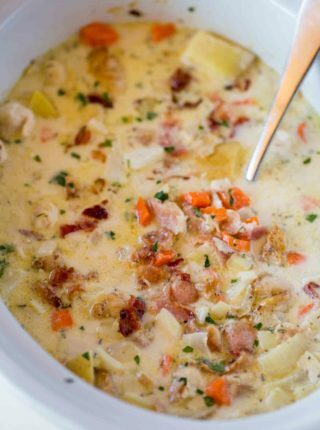 After a long day of playing in the snow, you’re going to love this thick, rich bacon filled chowder. Can I just be super bold and say this is the best clam chowder in the world? The recipe for this clam chowder actually started as a back of the can recipe that I’ve added and subtracted ingredients from over the years. Since then I’ve actually entered this chowder into multiple office contests when I worked in an office and in one local soup challenge. The results, this is an award winning clam chowder recipe! I have the free movie tickets I won to prove it! Get your bacon nice and crisp but not browned. The browned bacon will add an overcooked flavor to the soup. You can swap out the half and half for milk, you may need to mash some of the potatoes to add thickness to the soup. I’ve also made the Clam Chowder with heavy cream before and it is an indulgent treat! You can top with parsley as I have or chopped chives which add flavor as well as freshness. 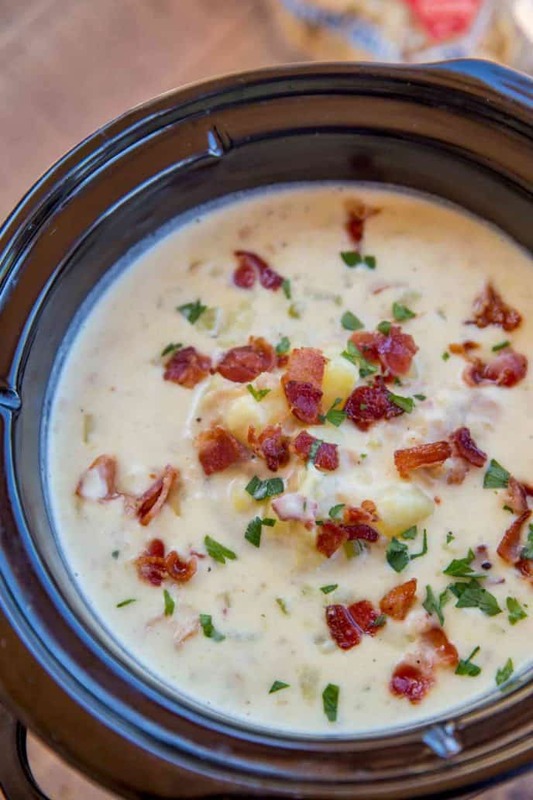 Want to make this clam chowder even better? My secret flavor boost is Clam Base. It isn’t something people generally keep in their kitchens so I left it as an optional ingredient in the directions, but I always add it! If you don’t want to buy Clam Base you can also buy Clam Juice to replace the water. What is the difference between New England Clam Chowder and Manhattan Clam Chowder? 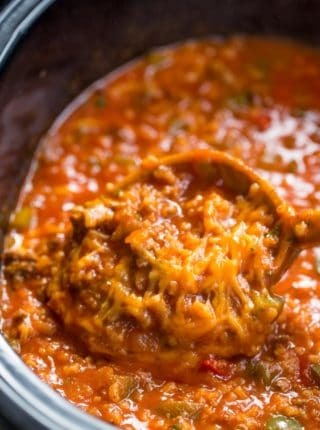 Manhattan Clam Chowder uses tomatoes and is often referred to as Manhattan Red Chowder. I used Yukon potatoes for their rich and buttery texture. You can also use red potatoes. I added celery because I love the added flavor of it and it reminds me of a lobster roll. You can also add carrots. For a huge flavor boost sauté your veggies in the bacon fat before adding (they will look less pretty in the soup). Garlic is a flavor not added to some clam chowders but I find it adds a great flavor to the soup which still tastes like your favorite classic chowder. Chopped Clams: I always use this brand and always use pre-chopped. You can also sub baby clams but the texture would be different than a classic clam chowder. Clam Base: I almost never buy boxes of broth because I keep the beef, chicken and vegetable version of this Better Than Bouillon. Or you can use clam juice in place of the water too if you’d like. 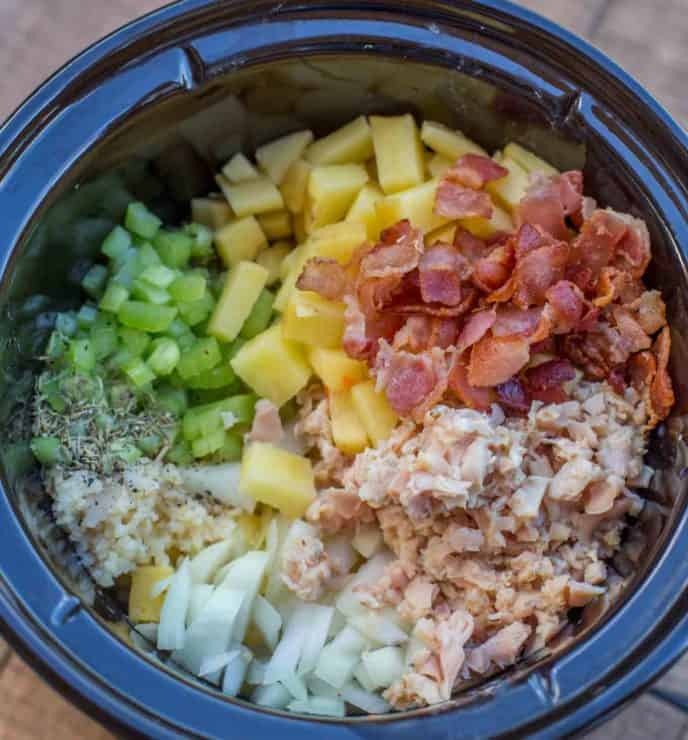 Add half of the bacon, clams, onion, potatoes, celery, garlic, water, Kosher salt, black pepper and thyme into the slow cooker and stir. Cook on low for 7 hours and refrigerate the remaining bacon for serving with the soup. In a measuring cup add the half and half with the cornstarch and whisk together. Cook on high for 30 minutes. * I add 1 tablespoon of Clam Base to the water to pump up the clam flavor in the chowder. Totally optional though. ** Truth? When I don't need it to look all pretty, I brown the onions and potatoes in this bacon fat before adding it to the slow cooker. *** You may want to heat the bacon slightly before sprinkling it on top since it will be cold from the refrigerator. Can we replace one cup of water for clam juice? I’ve never tried it that way but it sounds amazing! I made this and it was awesome! I followed directions to the “t” and used whipped cream rather than the half and half. (It’s not bathing suit weather) It was wonderful. My husband didn’t wish to wait for another serving. I had the leftovers in a freezer bag and he pulled them out for more! Thanks for dropping by to let me know, Joyce! I’m so glad you guys enjoyed it! My husband has a recreational clamming license and dug some beautiful surf (hen) clams last fall, which we froze. We are in Maine and expecting 2 feet of snow tomorrow so plan to make this. Thinking I may add some other seafood as well. Can’t wait to try it! I’ve updated the recipe card to show the nutritional information. Hope this helps! About 1 cup 🙂 Enjoy! Can I make this a day before and refrigerate it. I would like to make out for my dad and take it to him. My family loved it! And said was the best clam chowder ? Woohoo!! Thanks for coming back to let me know! Hey. Your recipe sounds amazing, but I have a 6qt slow cooker so was thinking of doubling the recipe. How would that change the cooking time? You might need to add an additional hour to the cook time. Enjoy! Hi Betsy, I put the clams in when the chowder is done. The heat from the chowder warms them to the perfect temp. After all, if the clams are canned they are already cooked. Never a rubbery clam will be had. Do I add the half and half mixture after cooking for 7 hours? I plan on trying this, but like my clam chowder on the thick side. Is this thick? How can I make it thicker if needed? I think it’s pretty thick but you could always mash some of the potatoes to thicken it more. Enjoy! This was last night’s dinner and it was wonderful!! You were the center of conversation around the dinner table last night. (Was your nose itching?) 🙂 I’m not a big fan of clam chowder and I thought it was really good so that’s gotta say something! I doubled the recipe because a 3 quart crock pot wouldn’t last long around here and I wanted some left over for his lunch. Saving half of the bacon until serving time was ingenous. Nice touch! It really enhanced the flavor! I had a question though – in your notes you mentioned that for added flavor to saute the veggies in the bacon fat. Did you mean the potatoes too? I wasn’t sure so I just did the onions, celery, and garlic. I’m so glad you enjoyed the chowder! You can never go wrong with sautéing in bacon fat 🙂 You can definitely add the potatoes in that process. My mom used to make fish chowder and added salt pork. Really tasty. I have only made corn chowder in my cooker. I have a new slow cooker but also one from the 70’s that is a regular cooker, has heavy insert for slow cooking and wire basket insert for deep frying. 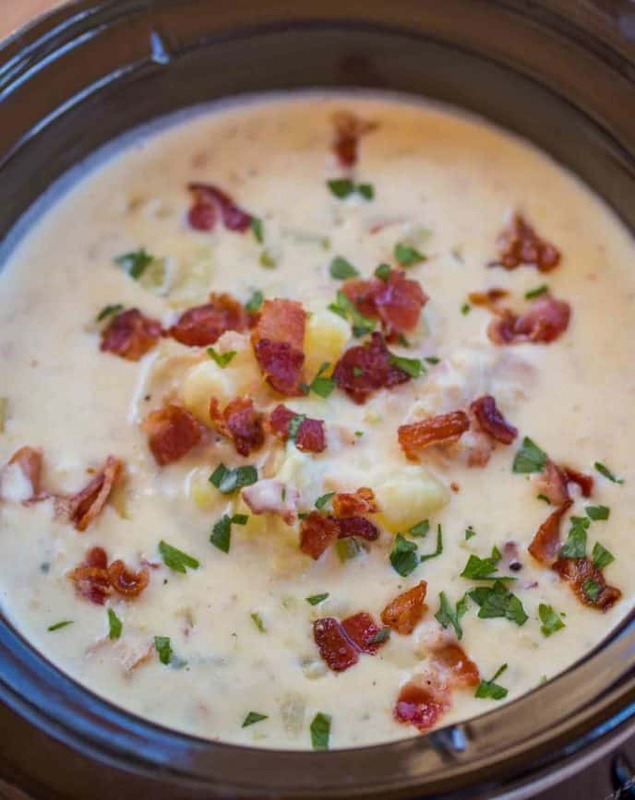 I’ve been looking for a great clam chowder recipe! Yay, no need to look any further!! I hope you enjoy it! I don’t remember the last time I did this but making it on the slow cooker is a great idea. Loving your version! Just in time for the soup season! I can’t wait to try this! I want to try this recipe. Just wondering if the clams stay tender and not get rubbery like some I have cooked. Any secrets to share to keep that from happening? The clams were pretty tender! 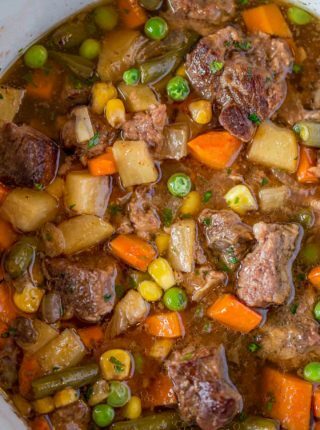 Bring on the slow cooker meals! I remember my grandmother making this soup growing up. 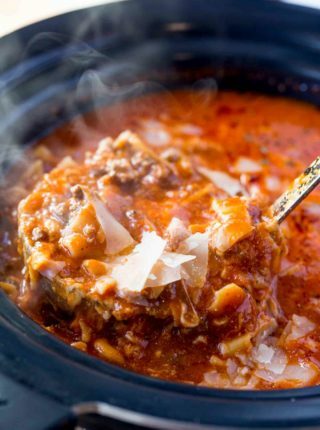 I love the idea of letting is slow cook in the crock pot! You know how much I love my slow cookers!! Clam chowder is such a fantastic winter soup… and definitely a favorite in our house!! The colder weather definitely makes you want to snuggle up with a bowl! Enjoy!! One request…could you please give an aproximation of how many cups/oz is one onion…two stalks celery….four potatoes and so on? I’m an experienced cook & pretty much know the quantities of vegetables I want in a recipe. But my daughter-in-law is not so experienced and has a problem with the quantities unless the recipe states 1 cup, or 3 oz of something. This is just a suggestion not a criticism & you are not the only blogger/chef/recipe author that does not state more exact quantities. Just my opinion. Thanks. For the ones with variation, I’d err on the lower amount, but if you find you have a half/quarter cup or so of ingredients left over just go ahead and throw them into the mix.